Incorporating a counseling paradigm has been shown to increase motivation, deepen learning, and sustain progress for clients and families. 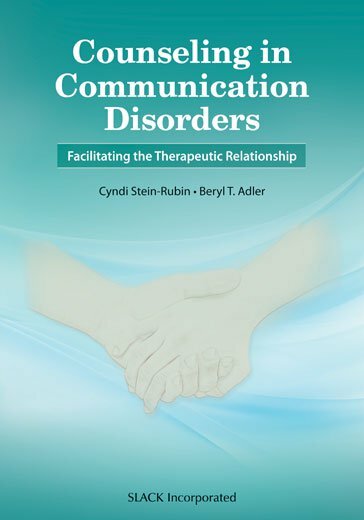 Counseling in Communication Disorders: Facilitating the Therapeutic Relationship by Cyndi Stein-Rubin and Beryl T. Adler, is an engaging textbook, written in a genuine and lively tone, so that the reader may easily relate to the material. The text provides a practical vehicle for speech-language pathology students, clinicians, clinical supervisors, and instructors to get to know themselves better and to integrate basic counseling attitudes and tools into their diagnostic and therapeutic programs. Inside Counseling in Communication Disorders, Stein-Rubin and Adler describe the importance of addressing a client’s communication challenges by working with the whole person, as a human being, not as a communication disorder. By approaching clients with a counseling attitude that encourages the client’s full participation in the treatment process, we then work together in partnership and as a powerful team. The content, techniques, and exercises within Counseling in Communication Disorders are rooted in evidence-based practice from a variety of psychological, counseling, and coaching approaches, such as Humanistic Counseling, Listening and Language, Narrative Therapy, The Cognitive Behavioral Model (CBT), Solution-Focused Brief Therapy (SFBT), Positive Psychology, Neurolinguistic Programming (NLP), and Mindfulness training. Counseling in Communication Disorders also includes reflective questions, exercises, and suggestions to reinforce important concepts. To bring the content to life, real-life and clinical scenarios are interspersed throughout the text. It is well understood that speech-language pathology and audiology clinicians must understand deep listening and how to choose words that will have a positive impact on their client and families, but often overlooked is the personal development of the clinicians themselves. Counseling in Communication Disorders is a comprehensive guide on how to provide the necessary support and encouragement to clients and build self-esteem, while a major focus is the need for the clinicians to work on self before working on other. Counseling in Communication Disorders: Facilitating the Therapeutic Relationship is the first textbook of its kind to comprehensively cover both sides of the therapeutic relationship. Students and clinicians alike will appreciate this unique approach that addresses not only the counseling attitude that is vital to the growth and progress of clients, but also the self-awareness that guides the personal development of the clinician. Cyndi Stein-Rubin, MS, CCC, TSSLD-SLP, CTA Certified Coach is a retired full-time faculty member, lecturer, and clinical supervisor in the Department of Speech, Language and Hearing Department Brooklyn College of the City University of New York (CUNY). She is a certified speech-language pathologist, professional life coach, and specialist in the field of human development. Mrs. Stein-Rubin the recipient of the 2009 college-wide Award for Excellence in Teaching and has served on the committee, for the past 4 years to select future award winners. Her area of expertise is in coaching and counseling students, clients, and families in the area of communication disorders, and her private practice focuses primarily on adults with disorders of fluency and voice. Cyndi Stein-Rubin delivers interactive and experiential workshops and presentations, drawing from fields such as psychology, counseling, and leadership. She lectures at universities, in the community, as well as internationally. Cyndi Stein-Rubin, is the first author of a co-authored textbook, A Guide to Clinical Assessment and Professional Report Writing in Speech-Language Pathology (Cengage Learning, 2012). Counseling in Communication Disorders: Facilitating the Therapeutic Relationship is her second book, co-authored by Beryl Adler. Beryl T. Adler, MS, CCC, TSSH-SLP has been a practicing speech-language pathologist for over 40 years, with extensive experience in language, articulation, fluency, and voice disorders. She received her master of science degree from Brooklyn College in New York in 1969. During her career, she has worked as a Clinical Supervisor and Instructor at the Brooklyn College Speech and Hearing Center and as an Adjunct Lecturer at Westbury Community College in New York and Brooklyn College, where she has taught a variety of courses in speech and language disorders. She founded Beryl Adler and Associates, a private practice in Brooklyn, in 1978. By 1984 she joined with Leda Molly and Gail Gurland to form Adler, Molly, Gurland with offices in Brooklyn and Manhattan. Ms. Adler's expertise and applied research in counseling families led to the development of a graduate course on the therapeutic relationship in communication disorders, which she has taught at Brooklyn College since 1988. Ms. Adler has presented workshops for parents, teachers, therapists, and supervisors throughout New York City. In 2012, she received the Speech-Language-Hearing Graduate Student Organization Distinguished Alumna Award for her contribution to the graduate students at Brooklyn College.